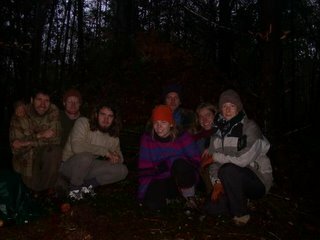 On Thursday we had a brief lecture on constructing shelters, we then went off into the woods and built some. This year, each clan chose to construct a "debris-pi" - sort of a tipi constructed with debris. We started construction probably around 11am and it gets dark around 5pm so we had time, but not an abundance of it. 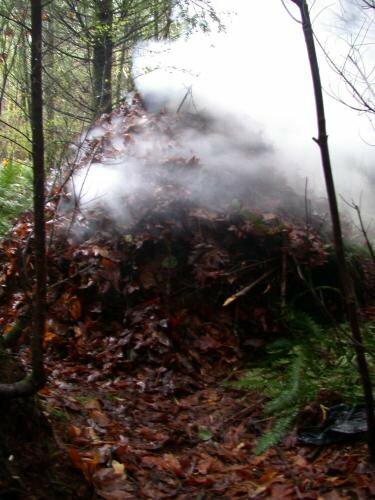 The basic format of the debris-pi was to build a sturdy frame out of sticks and then dump a bunch of debris on top, in this case mainly maple leaves that were in abundance and some sword fern that is also quite common there. Though it didn't rain much during the night, there was a moderate rain most of the day so it was challenging at times to keep energy up, but we soldiered on and by the time it was dark we were tired and wet but had a serviceable shelter. After the shelter had it's basic form complete we started a fire inside to start drying things out a little and to make sure that we had one before it got dark, we then continued to pile on more leaves and collect firewood to last us for the night. The shelter was kind of tight with seven of us stuffed in, but there was enough room for us to all lay down as long as nobody minded having somebody else laying on top of them. Clayton had asked around the day before and got the good idea to store as much firewood as we could in the shelter and rafters with us. That worked out really well, helping to dry the wood and making it so we didn't have to keep going outside. It was also fortunate that everyone was interested in minimizing bathroom breaks, so we all tried to hold things in as long as possible and managed with only two mass excursions outside to take care of business. Other clans took bathroom breaks piecemeal and some used bottles so that they wouldn't have to go outside. It took a little while to get a good blaze in the fire pit. With the wood so damp we needed it pretty hot to burn cleanly - smoke was something we constantly had to guard against. The fire kept everyone reasonably warm, although the person by the door was a little cold due to drafts, and if you had some part of yourself behind someone else (such as head or feet when trying to lay down) they would get chilled. The fire required constant vigilance since it would continually encroach upon the borders of the pit and would regularly catch some of the floor insulation (mainly sword fern fronds) on fire which we would then have to beat out. It was difficult to sleep in the arrangement, some people didn't sleep at all a couple managed as much as two or three hours, I got probably between 15 and 30 minutes. We didn't really try to sleep for the first half of the night though, we realized how difficult it would be and instead stayed up singing songs and telling stories. I think that if we had stayed another night in the shelter it would have been easier to get more sleep. Probably some sleeping would be done during the day since the only urgent thing to do would be collection of firewood, and with the tiredness from the previous night we would probably be a lot more inclined to get down to the business of sleeping that night. Last week Jon Young came and spent a couple of days with our program. It was inspirational, but a lot to process all at once. While he was there we went out to our bird sit spots for awhile and were supposed to come back with a question. I ended up having a lot of fun looking around my place and noticing a lot of things that I hadn't seen before. In the past I haven't usually had much fun at my sit spot. Mostly I would try and concentrate more on what I was "supposed" to do, or start thinking about various internal distractions. After my experience above I decided to try and rekindle a sense of fun while at my spot. Instead of just going and doing what I was supposed to I went and paid attention to what caught my fancy. I explored around and watched birds, I ended up finding about five plants that I hadn't realized were in my area before (despite having previously cataloged all the ones that I was aware of). I still did what I had been focusing on in the past, but incorporated it into my fun. One thing that Jon Young mentioned was the routine "owl entering the forest." Basically it entails taking a lot of care to avoid disturbing birds even before you start to leave your house for your sit spot. It takes a lot more time to get to my spot that way, so it's not something I'm likely to do everyday, but apparently the more you do it the less the birds will react to you even when you don't do it. I did it on Sunday and found it to be quite enjoyable. I noticed much more bird language than I had on probably any other day in my life. I think that's a mix of the exercise and my increasing awareness of birds in general. It makes me happy to realize how much more I recognize of birds now than I did at the beginning of the program. I still feel like I'm a beginner, but now I can distinguish several additional birds by their calls as well as being more aware of whether they are alarming. Tomorrow we are going on to camp overnight in group shelters.